Niels Henrik David Bohr (Danish pronunciation: [ni:ls ˈboɐˀ]) was a Danish physicist who made foundational contributions to understanding atomic structure and quantum mechanics, for which he received the Nobel Prize in Physics in 1922. Bohr mentored and collaborated with many of the top physicists of the century at his institute in Copenhagen. He was part of a team of physicists working on the Manhattan Project. Bohr married Margrethe Nørlund in 1912, and one of their sons, Aage Bohr, grew up to be an important physicist who in 1975 also received the Nobel Prize. Bohr has been described as one of the most influential scientists of the 20th century. In 1922 Niels Bohr was awarded the Nobel prize in physics "for his services in the investigati Niels Henrik David Bohr (Danish pronunciation: [ni:ls ˈboɐ̯ˀ]) was a Danish physicist who made foundational contributions to understanding atomic structure and quantum mechanics, for which he received the Nobel Prize in Physics in 1922. Bohr mentored and collaborated with many of the top physicists of the century at his institute in Copenhagen. He was part of a team of physicists working on the Manhattan Project. 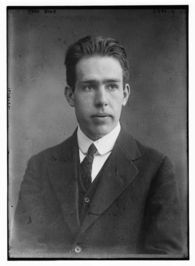 Bohr married Margrethe Nørlund in 1912, and one of their sons, Aage Bohr, grew up to be an important physicist who in 1975 also received the Nobel Prize. Bohr has been described as one of the most influential scientists of the 20th century.